Thought he could stay in NHL: "I think it was poor of Boston." Yesterday Per-Johan Axelsson made a comeback in Frölunda. After 11 years in NHL he felt rejected and fooled by Boston. "It was bad. They said they were interested in but it wasn't so," says Per-Johan Axelsson, 34. In Boston Per-Johan Axelsson was one of the great profiles and during latter years he was a veteran of the team and club. In spring his deal with Boston ended but fans and Per-Johan Axelsson himself were hoping he'd play in Boston another year. But Pebben became a pawn in political game where money plays the main role. He also was fooled by team management. "When the season was over in Boston, I went to team management and said that I want to stay. I could play for a lower price too," says Per-Johan Axelsson. Pebben and Boston talked during the whole summer and he thought he would stay in the club. But such a contract offer didn't came. "I think it was bad from Boston. They said they were interested but it wasn't so. But everything is relative there," says Axelsson. 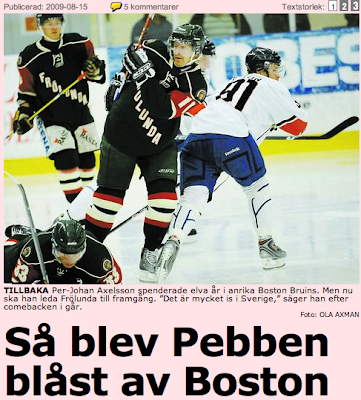 When Pebben decided to continue his career in Frölunda, he got 2 calls from Boston. "Both Don Sweeney and Cam Neely called and thanked me for the time in Boston." Yesterday Pebben played his first game in Frölunda (4-3 against LHC). He was tired and rested most of the third period in the game against Linköping (LHC). "There's lot of ice in Sweden. It is actually a huge difference from NHL. But my game will come. I will train extra," says Pebben. He also thinks that the game is different in Sweden compared with NHL: "In NHL it's more puck in the stick and go." Even though Pebben didn't have a perfect game, Frölunda won 4-3. There was also a first taste about the 1st line, in which Riku Hahl will center Joel Lundqvist - injures yesterday - and Per-Johan Axelsson. Editor's note: You read that right, folks: P.J. is back on the top line. He already has at least an assist in preseason play. Thanks again to sleza for translating this for us. Holy crap I can't wait for the season to start. cam neely and don sweeney are idiots. THEY NEVER SHOULDA LET SUCH A VALUABLE PLAYER LEAVE. PJ Axelsson the Bruins will never be the same without you! Best of Luck in Sweden! !